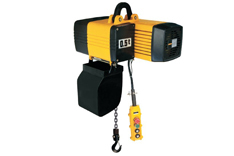 An electrical chain hoist is a device used to lift heavy objects. 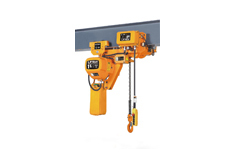 Consisting of an electric motor driving a set of gears, the chain is placed between the gears of the electrical chain hoist. 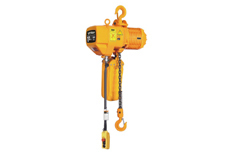 When the motor is activated and the gears are turned, the chain is pulled up or lowered down, depending on the direction of the motor. 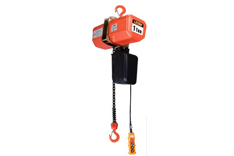 In some models of electrical chain hoist, a pair of pulley-like devices known as chain falls are attached to the hoist motor to make the lifting of very heavy objects possible through very little effort from the hoist motor.